There have been months of roadworks. A complex junction has been remodelled to be friendlier to pedestrians and cyclists. The traffic has been rerouted this weekend, though there is still a lot of work to do to turn the old carriageway into the pleasant space envisaged by TfL’s artist (and nor do the fluffy white clouds and blue sky appear to be fully functioning yet). Walking home yesterday evening, we passed the brand new shiny bus shelter placed ready for the repositioned bus stop. 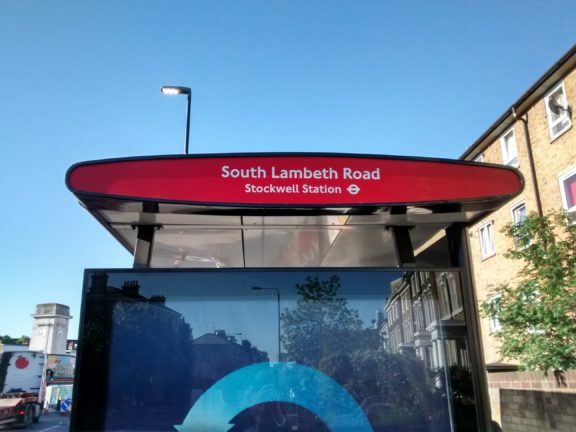 Somewhat unfortunately, the sign contained a glaring typo – Lambeth had somehow become Lambert.1 One of our number suggested that we report it, which would certainly have been public spirited, but raised both questions (how? to whom?) and doubts (would anybody take any notice?). As it happens, TfL has some form on this, which suggested that social media might be both easier and more effective. And what could be a better excuse for a snarky tweet? The team behind @TfLBusAlerts is generally pretty good: I have found them consistently responsive, helpful and human. So I wasn’t altogether surprised to get a quick and informed reply. It’s hard to imagine a more trivial interaction between a public service and one of its users. But it’s a lovely little example of how being on the ball in the use and tone of social media can make a huge difference to engagement. TfL has an entire page setting out how it wants to be contacted about what, with 23 separate options (and a 24th for when you have a problem with the first 23). That’s understandable because TfL is a big complicated organisation which does many things – but for precisely that reason it should be doing its best to shield normal people from that complexity, not forcing us to navigate it. So kudos to them for being willing to subvert their own processes – and a challenge to the rest of us to make sure that we too are part of the conversation. Meanwhile, as part of the same scheme, a new cycle hire docking station has been built, which opened a couple of weeks ago. The entire point of the work is to convert something which is a bit like a roundabout (but not very like, because it wasn’t possible to drive all the way round it) into something which is not at all like a roundabout (as is obvious from the picture at the top). So what’s the best possible name for this brand new docking station? Of course. 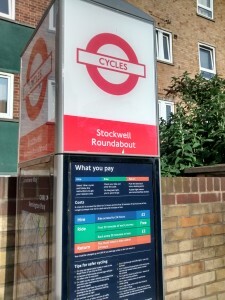 Stockwell Roundabout. Let’s see what social media can do about that one. And ten days later, the bus stop is fixed, so we all know where we are again. 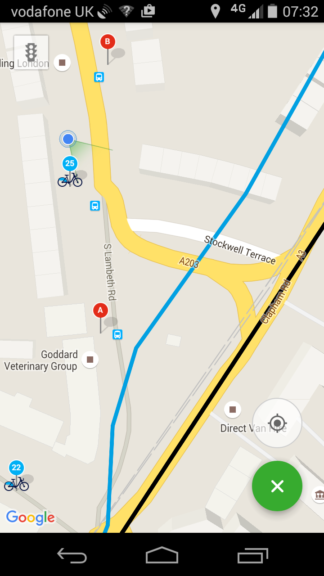 I also happened to spot through Citymapper that Google maps has picked up the new road layout quickly and efficiently – but whatever the information flow which does that has failed to spot that it’s unlikely that a bus stop has stayed where it was if the road has been moved away from it. Representing reality remains a challenge.